Over Priestacott Farm in Ruby Country is a small family run business in the village of Ashwater and is a beautiful place to stay when visitinis part of rural Devon. 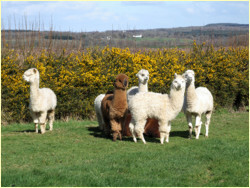 We farm Alpacas pigs, chickens and have a large worm-breeding unit. Located near the Ruby Country market town of Holsworthy and close to the Cornish border, we are in an ideal position for visiting both Devon and Cornwall. We have a four-berth family caravan in a quiet secluded position, which has kitchen, shower room, toilet and central heating. It sleeps 4 people comfortably however the top bunk is only suitable for a small child. The caravan is available to rent from April to October and is available on a self-catering or bed and breakfast basis. To find out about costs and to check availability, please get in touch. This entry was posted in Accommodation, Self catering and tagged accommodation, Ashwater, Devon, farm holidays, Holsworthy, Horse riding, local produce, ruby country, self catering, walking. Bookmark the permalink.